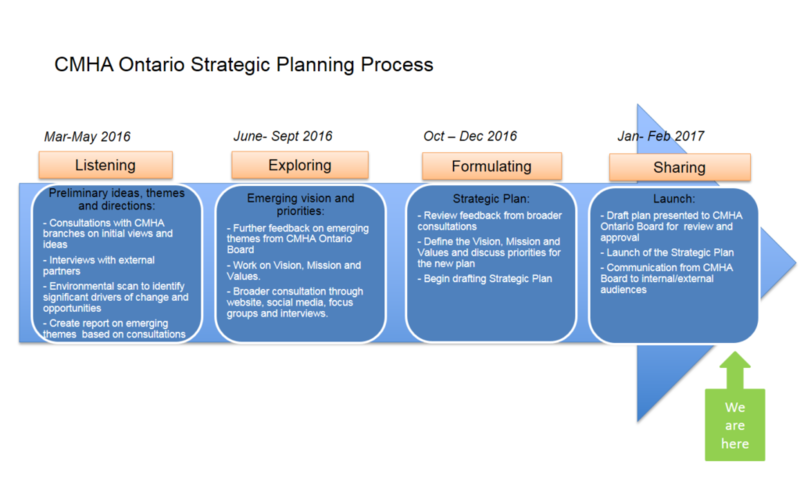 The development of our 2017-2020 Strategic Plan was the culmination of a broad and extensive consultative process. Through in-person regional meetings, surveys, social media engagement and one-on-one meetings, we were provided valuable insight which now informs our work moving forward. We heard from CMHA branch staff, our local and provincial CMHA board members, external partners like you, people with lived experience and their families and the public. We value and appreciate everyone’s feedback. The result is a plan that lays out a bold direction for CMHA Ontario with a more impactful vision and missio, four strategic priorities, and ten core directions for the future. Read our new Strategic Plan for more details.